Northern Ireland Highway Code rules 226 to 237. Do not drive in these conditions unless your journey is essential. If it is, take great care and allow more time for your journey. Take an emergency kit of de-icer, ice scraper, torch, warm clothing and boots, first aid kit, jump leads and a shovel together with a warm drink and emergency food in case you get stuck or your vehicle breaks down. 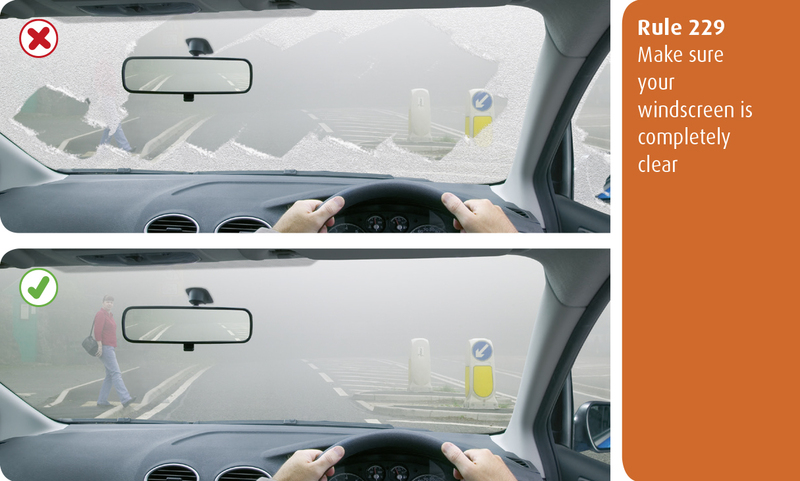 Before entering fog check your mirrors then slow down. If the word ‘Fog’ is shown on a roadside signal or overhead gantry but the road is clear, be prepared for a bank of fog or drifting patchy fog ahead. Even if it seems to be clearing, you can suddenly find yourself in thick fog. You must not use front or rear fog lights unless visibility is seriously reduced (see Rules 226), as they dazzle other road users and can obscure your brake lights - you must switch them off when visibility improves. Keep your vehicle well ventilated to avoid drowsiness. Be aware that the road surface may become soft or, if it rains after a dry spell, it may become slippery. These conditions could affect your steering and braking. If you are dazzled by bright sunlight, slow down and if necessary stop.